Or so it seems from a new survey placing those three digits above looks, ambition, courage, and sense of humor. She’s a 793? Swipe right! It turns out credit scores are statistical shorthand for a whole lot more than the likelihood you'll repay a loan, according to a number of consumer surveys and academic studies. One study, released two years ago, looked at consumer credit data over 15 years and found that the higher the year-end credit score, the likelier the person was to form a romantic relationship over the next year. Now comes a survey from Discover Financial Services and Match Media Group, parent of Tinder and other dating sites, that shows just how appealing a good credit score can be. 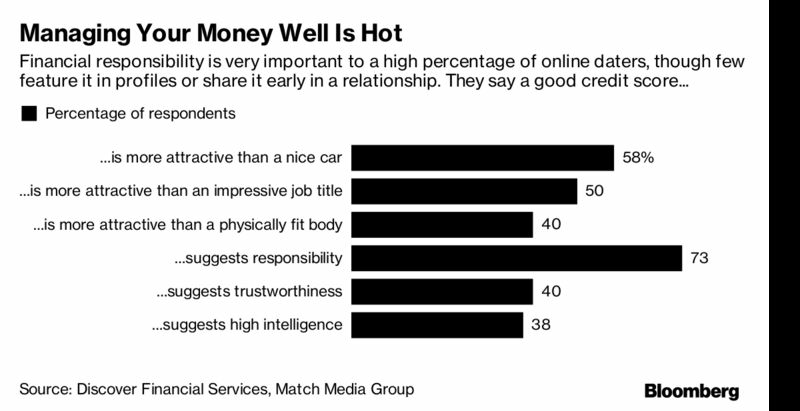 Financial responsibility was ranked as a very or extremely important quality in a potential mate by 69 percent of the 2,000 online daters surveyed. That placed it ahead of sense of humor (67 percent), attractiveness (51 percent), ambition (50 percent), courage (42 percent), and modesty (39 percent). A good credit score was associated with being responsible, trustworthy, and smart. That’s right. These amorous respondents effectively put credit score 18 points ahead of cute.